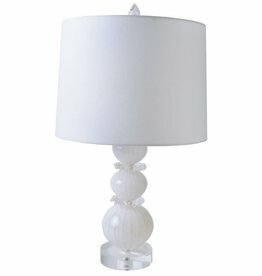 Snowball table lamp / Simply elegant this boudoir lamp features a blown glass sphere detailed with signature pinched clear glass bobeche on a clear glass mounting. Topped with a white linen over styrene oval shade and clear glass sphere finial. 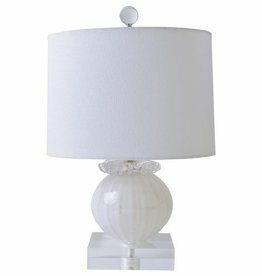 Cool and Elegant Gilded Nola Blanche table lamp. 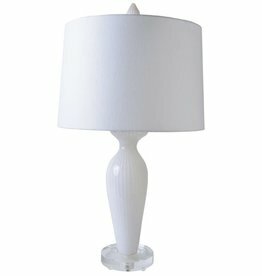 Blanche table lamp has a clear glass base with a white blown glass finish and a round white linen shade. Dimensions: H 28.5", W 16", D 16". Dimensions: H 28.5", W 16", D 16"